Geometric measure theory is the mathematical framework for the study of crystal growth, clusters of soap bubbles, and similar structures involving minimization of energy. Morgan emphasizes geometry over proofs and technicalities, and includes a bibliography and abundant illustrations and examples. 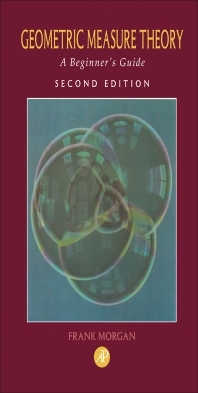 This Second Edition features a new chapter on soap bubbles as well as updated sections addressing volume constraints, surfaces in manifolds, free boundaries, and Besicovitch constant results. The text will introduce newcomers to the field and appeal to mathematicians working in the field. Mathematicians working in related fields, and graduate students. The book is intended for newcomers to the field of geometric measure theory. Preface. Geometric Measure Theory. Measures. Lipschitz Functions and Rectifiable Sets. Normal and Rectifiable Currents. The Compactness Theorem and the Existence of Area-Minimizing Surfaces. Examples of Area-Minimizing Surfaces. The Approximation Theorem. Survey of Regularity Results. Monotonicity and Oriented Tangent Cones. The Regularity of Area-Minimizing Hypersurfaces. Flat Chains Modulo (, Varifolds, and (M, (, ()-Minimal Sets. Miscellaneous Useful Results. Soap Bubble Clusters. Solutions to Exercises. Bibliography. Index of Symbols. Author Index. Subject Index. Frank Morgan is the Dennis Meenan '54 Third Century Professor of Mathematics at Williams College. He obtained his B.S. from MIT and his M.S. and Ph.D. from Princeton University. His research interest lies in minimal surfaces, studying the behavior and structure of minimizers in various settings. He has also written Riemannian Geometry: A Beginner's Guide, Calculus Lite, and most recently The Math Chat Book, based on his television program and column on the Mathematical Association of America Web site.